When Edmund Hill’s letter reached Frederick Law Olmsted in March of 1890, Olmsted had established himself as America’s preeminent and most sought after landscape architect. At the time, he was actively engaged in several large projects, collaborating with Leland Stanford to convert his land into a university campus, drawing up plans for George Washington Vanderbilt’s 6,000-acre Biltmore estate, and getting ready to plan the grounds for the World’s Columbian Exposition of 1893 in Chicago. On September 16, 1890, the park committee approved Olmsted’s preliminary plan for Cadwalader Park. 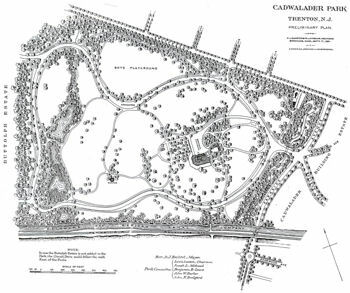 Unfortunately, neither the preliminary plan of the park nor the many working drawings and more detailed maps prepared by the Olmsted firm survive. Olmsted’s park plans were stored in the Trenton Armory, which was destroyed during a raging fire in 1975, burning most of the original plans along with thousands of irreplaceable historical documents. One important plan discovered in Trenton’s City Hall in the 1970s is a lithograph of The Preliminary Plan of Cadwalader Park, dated September 17, 1891. 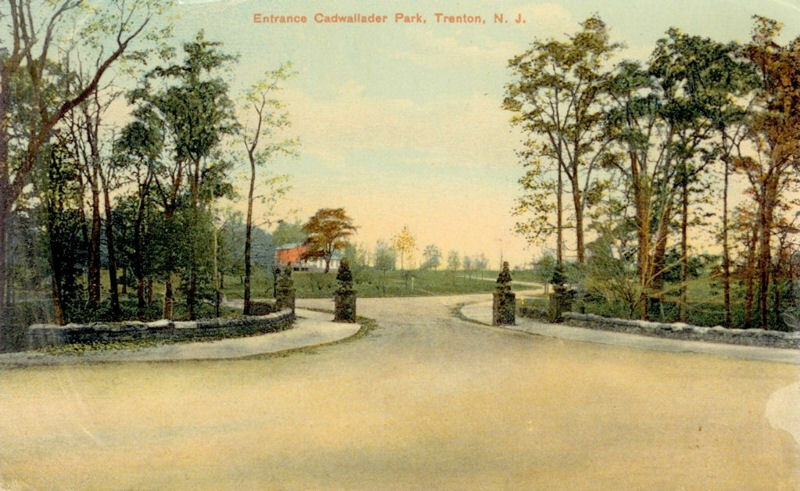 According to Olmsted historian, Charles Beveridge, this plan “represents the final version of Olmsted’s design for Cadwalader Park.” Olmsted’s plan includes all his signature elements of park design: winding circuit drives and pedestrian paths, open meadows and groves of trees. The plan also anticipates the future development of Cadwalader Heights, identified as “Cadwalader Building Estate,” with Bellevue and Rutherford Avenues proposed to converge at Parkside Avenue, directly opposite the park.